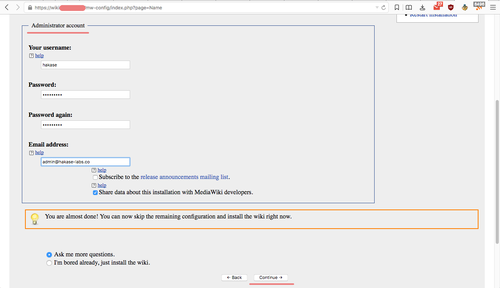 In this tutorial, I will show you step-by-step how to install MediaWiki with Nginx web server on Ubuntu 16.04. I will guide you on how to install and configure the LEMP stack for MediaWiki installation, including generating and configuring new free SSL Letsencrypt for MediaWiki security. MediaWiki is one of the most popular wiki software that was originally developed for use on Wikipedia. It's a free and open source software written in the PHP programming language, and has become the most dominant software in the wiki category. Originally developed by Magnus Manske in 2002, the tool is now on version 1.30. MediaWiki has been used by many big companies/organizations including Nginx, Intel, Novell, and NASA. The first step we must do for the MediaWiki installation is to install the web server. So in this section, we will install the Nginx web server, start the Nginx service, and then enable it to launch automatically at system boot. Before installing the Web server, connect to your server, update all repositories, and then upgrade. 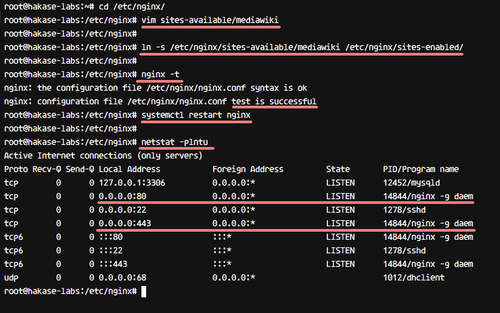 Now install Nginx using the following apt command. After that, start nginx and enable it to launch at system boot. Now check the HTTP port using netstat and make sure you see port 80 being used by Nginx. The Nginx web server has been installed on Ubuntu 16.04. Now we will install the PHP-FPM on Ubuntu 16.04. And we will be using PHP 7.0 for MediaWiki installation. Install PHP and PHP-FPM (along with all required extensions) using the apt command below. 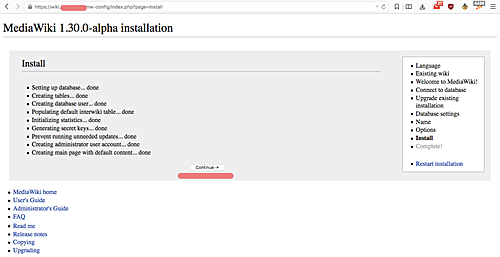 And after the installation is complete, we need to change some default configuration for PHP-FPM. We need to increase the upload max file size as well as the memory limit configurations. Go to the PHP configuration directory and edit the php-fpm 'php.ini' file using vim. Increase the 'upload_max_filesize' configuration to '20M', and increase the 'memory_limit' to '128M'. Now restart the PHP-FPM service and enable it to automatically launch at boot time using the following systemctl commands. PHP-FPM now is running on Ubuntu 16.04, and it's running under the sock file. Check it using the netstat command below. And you will get the PHP-FPM sock file as shown below. MediaWiki stores all data and content in the database, and it's compatible with a variety of database servers. For this guide, we will be using the MySQL database for MediaWiki installation. In this step, we will install the MySQL database server and then create a new database and user for MediaWiki. 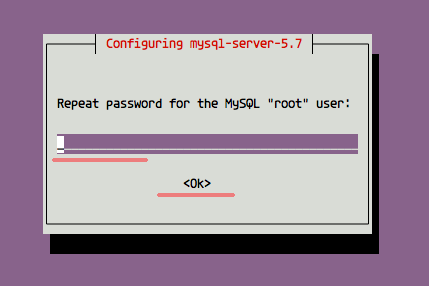 Install MySQL database on Ubuntu 16.04 using the following apt command. You will be asked for the MySQL 'root' password - type your own password and press 'Enter'. 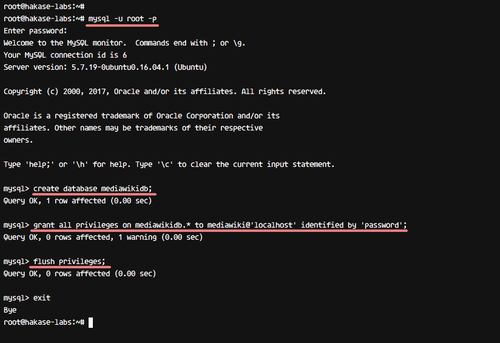 Repeat your MySQL 'root' password. MySQL installation is complete. Now start MySQL and enable it to launch at boot time using the systemctl commands below. Next, we will create a new database and user for MediaWiki. We will create a new database named 'mediawikidb' with the user 'mediawiki' and password 'mypassword'. Connect to the mysql server using the mysql command below. Now create the database and user with the following MySQL queries. MySQL server installed on Ubuntu 16.04, and the database for MediaWiki installation has been created. For this guide, we will be using the latest MediaWiki version 1.30. 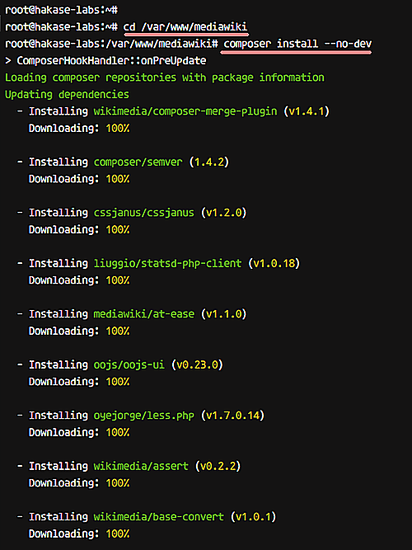 And before we download MediaWiki, we need to install some packages on the server. Run the apt command below to install new packages. Now create new 'mediawiki' directory and clone mediawiki source code to that directory. 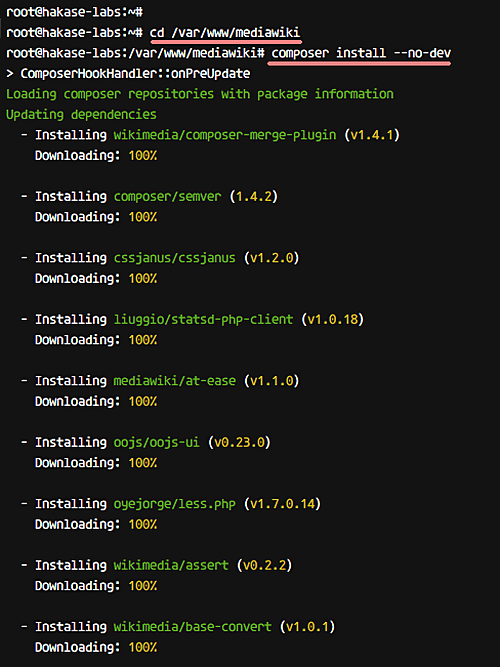 Next, go to the '/var/www/mediawiki' directory and install some PHP dependencies needed for the MediaWiki installation using the composer command. After all PHP dependencies installation is complete, change the owner of the mediawiki directory to 'www-data' user and group. 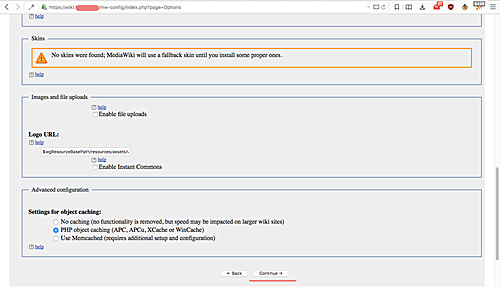 The latest version of MediaWiki 1.30 is downloaded in the '/var/www/mediawiki' directory. For security reasons, we will run MediaWiki under the HTTPS connection. All HTTP connections will be automatically redirect to HTTPS. And for this purpose, we need SSL certificates. We will be using free SSL from Letsencrypt. After the installation is complete, stop the Nginx web server. Next, generate new SSL certificates using the letsencrypt command below. You will be asked for your email address - it's used for certificate renew notification. So, type your email address and choose 'OK'. 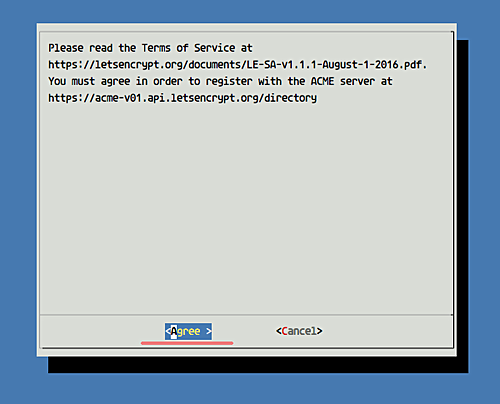 For the Letsencrypt TOS (Terms Of Service), choose 'Agree' and press Enter. And now type your wiki domain name, mine is 'wiki.hakase-labs.co'. And when it's all done, you will get the result as shown below. 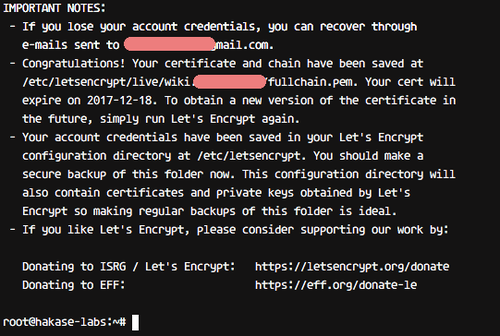 SSL certificates for MediaWiki installation has been generated in the '/etc/letsencrypt/live' directory. The LEMP stack (Linux, Nginx, MySQL, and PHP-FPM) for MediaWiki installation has been set up, and the MediaWiki source code has been downloaded in the '/var/www/mediawiki' directory. In this step, we will create a new Nginx virtual host file 'mediawiki', and then activate the virtual host. Go the Nginx configuration directory and create a new virtual host file 'mediawiki' using vim. Paste the following Nginx virtual host for MediaWiki configuration there. Change as per your requirement/case, and then save and exit. Next, activate a new mediawiki virtual host using the following command. Test nginx configuration and make sure there is no error. Then restart the service. A new HTTPS port 443 is opened on your server - check it using the netstat command in the following way. Shown below is the result. Now open your web browser and type your domain name into the address bar. And you will be redirected to the HTTPS connection. Click the 'set up the wiki' link on the page to configure MediaWiki. Choose your own language, we will choose 'English' and click 'Continue'. And now, MediaWiki will perform environment checking. Make sure you get the result as shown below. Now for the Database configuration. In the 'Database name' field, type 'mediawikidb' with prefix 'wiki_'. 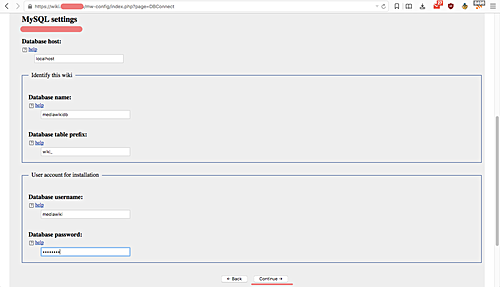 Next, type the database user 'mediawiki' and password 'mypassword'. As for the Database settings, just leave it default and click 'Continue'. Now we need to create the administrator account. Type your own user, password, and email as shown below. And you should get to the page about 'MediaWiki Additional Configuration'. Leave it with default values, and click 'Continue'. Now click 'Continue' again to install MediaWiki. And you will get to the page similar to the one shown below. Now you will see the page says installation is complete. You will be prompted for downloading new file 'LocalSettings.php' - download the file. And upload the 'LocalSetting.php' file to the server mediawiki directory '/var/www/mediawiki'. Also, do not forget to change the owner of the file to 'www-data' user and group. Now, come back to your web browser MediaWiki installation page, and click the link 'enter your wiki'. You will be told that MediaWiki has been installed with Nginx web server on Ubuntu 16.04 server. 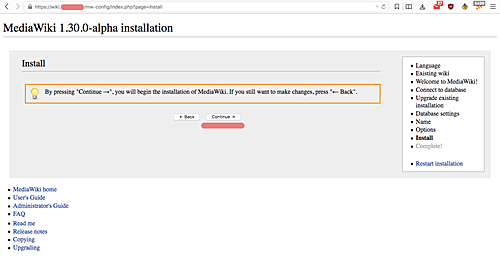 At this stage, mediawiki installation has been completed. And in this step, we will configure the default skin/theme. Go to the '/var/www/mediawiki/skins' directory and clone the default skin 'Vector'. Now edit the 'LocalSettings.php' file using the vim editor. And paste the following php code towards the end of file. That's it. Save and exit. Come back to your web browser and refresh the MediaWiki page. 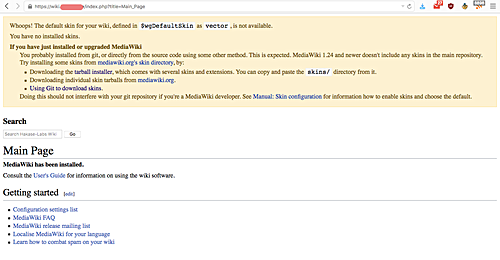 Make sure you get the MediaWiki with 'Vector' skin as shown below. 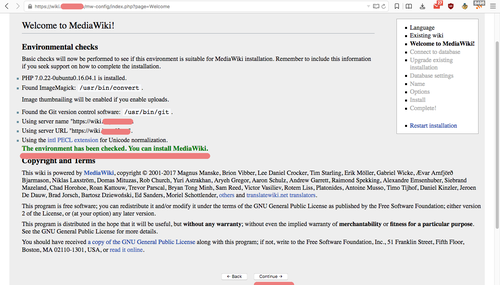 MediaWiki installation and configuration with Nginx web server on Ubuntu 16.04 has been completed successfully. What about the step to configure DNS? Thank you so much! Is it okay if I post a summarized version with tips I learned on Medium? Just FYI, this post appears to now be out of date. The tutorial is for Ubuntu 16.04 and it works fine on that Ubuntu version until now. I guess you used it on a wrong Ubuntu version where the article is not written for. It must fail there as other Ubuntu version have other php versions and the php version is part of the name of the packages that you install. Always use an article for the operating system version where it is made for.